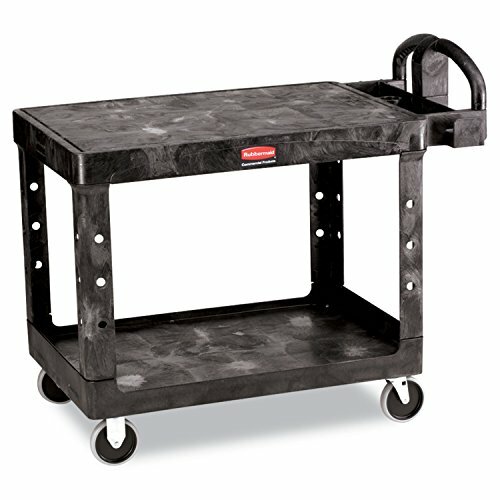 The Rubbermaid Commercial Heavy-Duty Utility Cart, 2 Shelf, Medium, is constructed of sturdy structural foam that will not dent, chip, or peel. 2 shelves support up to 500 lbs. of materials throughout the facility. Crafted with ergonomic handles for perfect hand placement, this rolling cart has rounded corners to protect walls and furniture and 4" non-marking swivel casters for lightweight maneuverability. With molded handle compartments for additional storage, molded fittings for rolled supplies and easy-access top and bottom shelves, this is a versatile and indispensable utility cart for any facility.